With a wealth of experience in the Hire Industry stretching back to 1974, P.E.T. aim to ensure our customers recieve a quality product and efficient service which can”t be bettered. Our trained team work in purpose built conditions ensuring everything we provide for hire is in pristine condition & ready to go. 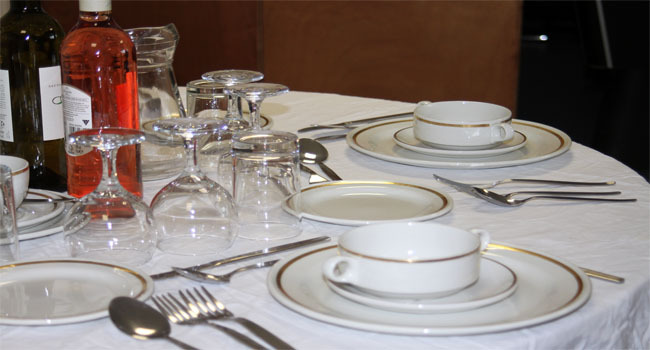 Our fine crockery is a complete dinner & tea service. It is an elegant white bone china with a gold rim design, completely dishwasher safe. Great care is taken by our staff in checking that your china reaches you in perfect condition. All china is sterilized and plates are packed in bundles of 5’s and 10’s for ease of counting, then shrink wrapped for protection and hygiene. We have a very large range of glassware including Paris Goblet wine glasses, champagne saucers and cocktail glasses. Beer and shot glasses, slim jims, brandy balloons, wine carafes and punch bowls. We hire large catering equipment delivered to your door, ready to use. A wide range of tables and chairs, padded, or folding are also available.